During my holiday in Spain, I took a lot of photographs. he will probably say, that they look inconsistent and without theme. a photograph of a dog, children playing in the fountain and a photographs of street signs and buildings. Indeed they do look inconsistent. Eugene Atget, Helen Levitt, Berenice Abbott and Henri Cartier-Bresson. Before departing to Madrid, I've researched the works of the above four photographers in order to emulate some of their photographic techniques and skills. the lives of ordinary people, such as the one shown above. of making money and perhaps the cruelty of social injustice. Their clothe look old and worn, indicating that they belong to the low class of the society. 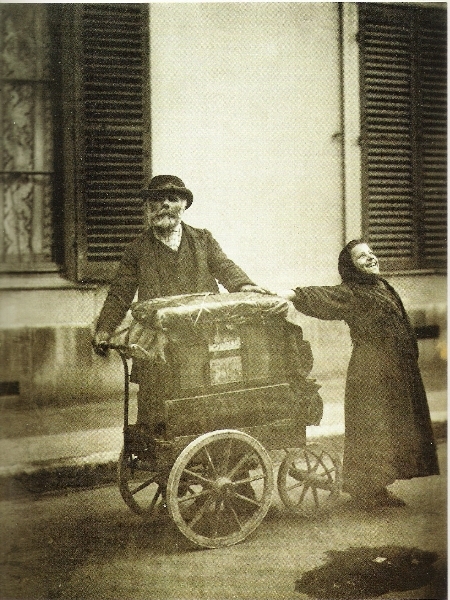 summarises the difficulty of the lives of many working class people living in this period in Paris. for more than twenty years. 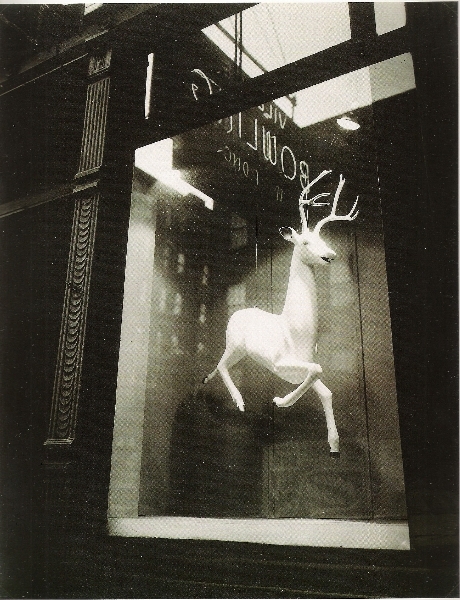 In her early days, she studied photography in New York as well as in Paris during which she discovered a talent of city photography. describes well how she viewed this city. of her skills to realise small objects or events that describes the overall atmosphere of the city. photographer from the age of 23. 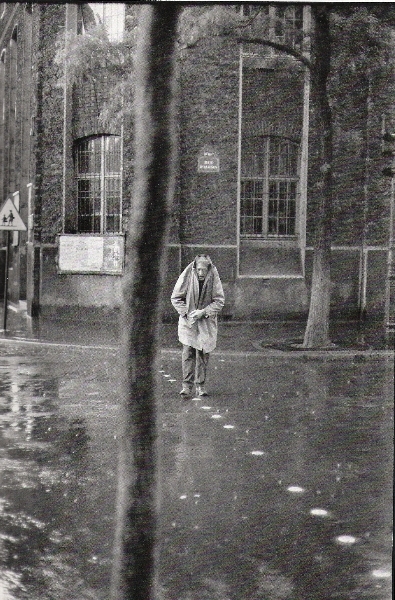 Both photographs shows a person walking across a street. With the skills of Cartier-Bresson, this ordinary topic is turned into an amazingly interesting subject. quirky atmosphere. The photograph prompts the viewer to ask, why there is nobody else around? Who is she? What time of the day is this? 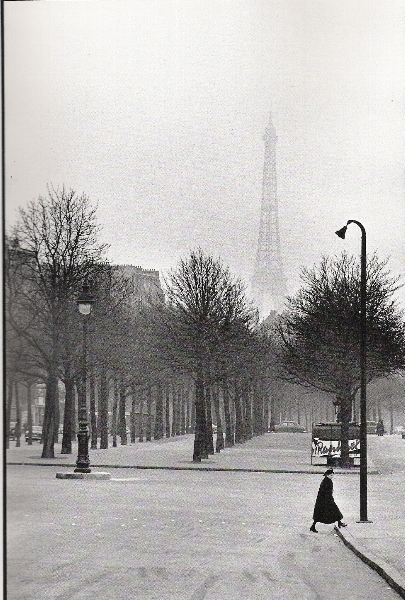 Where in Paris was the picture taken? the effective use of a tree which boldly cut through the middle of this photograph, a very interesting composition. become artistic piece of work. who lived in the poor districts. Her photographs of children are particulary famous..
favourite playground and a barely seen scoreboard on the left, hints that this place is used as a baseball ground. The buildings shown on the right, behind the fences, look derelict and indicates that this is one of the poor districts in New York. 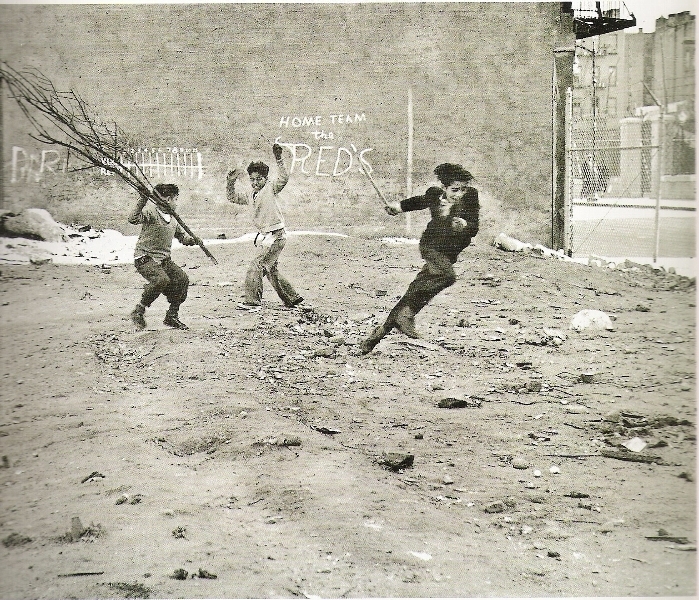 The three boys are in full motion, one running away desperately but with a smile, the two boys on the left fighing each other, not violently, but playfully. Overall, this photograph brings the viewr back to his youthful days and stirs nostalgia. I really like the photographs of children taken by Helen Levitt. I will try to take similar photographs of children that give a warm feeling to the viewer. The photographs of the above four photographers stir my emotions and make me relate to the photographers' feeling when the photographs were taken. Each of the above photographer captures the lives of the people in distinctly identifiable places, with the minimal amount of information on the photograph. The focus is on people, but the message is attached to the location. I will take account of these attributes during my trip to Spain.